The team at Boom! 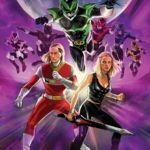 Studios has announced yet another expansion into their fan-favored Power Rangers comic book universe! A new graphic novel titled THE PSYCHO PATH has just been announced. As you might have guessed from the name, this story features the return of the sinister Psycho Rangers! Revived once again and with even greater abilities, this team of villains confronts former Space Ranger Andros and former Galaxy Ranger Karone in a battle that could decide the fate of the universe. This new comic will be written by long-time Teenage Mutant Ninja Turtles author Paul Allor and drawn by Boom! alumni Marcelo Costa -whose work was previously seen in Soul Of The Dragon. “The Psycho Path” is currently scheduled for release on October 9 2019! Agter some extensive coverage of this years New York Toy Fair, it’s to share a gallery with the community that we just could not wait on any longer.Power Rangers & Super Sentai collectors are no strangers to special edition repaints & limited releases. And often items in this category can become increasingly rare & expensive over time, but one release in particular is one of the most sought after pieces in Power Rangers history. Mostly because of it’s extremely limited release venue. Well today we have a rare opportunity to share with you a full gallery of the Deluxe 14K Gold Plated Galaxy Megazord! And we’ve also given it a side by side comparison with it’s closest Japenese counterpart, DX Black GingaiOh! The Gold Galaxy Megazord was an expensive and limited release that was originally only sold at the now defunct FAO Schwartz retail chain. When these began surfacing in the early 2000’s many collectors simply didn’t believe they were real. At one time there were thought to be lass than 5 in existence as well, now that number has been proven to be closer to around 15+. Because of it’s limited nature and the authentic 14K gold used to plate it, this set has commanded high prices for years, luckily we were able to snag one for an amazing deal for this gallery. We’ve attached a small selection of images to this post but please enjoy over 75 images of this magnificent set after the jump by clicking “Discuss on the TokuNation Forums” at the bottom of this post. It was an honor to be able to handle such a limited set and I hope the community enjoys getting a good look at it. I’ll be back soon with a look back at another sought after limited repaint as well, DX Black Daizyujin from Kyoryu Sentai Zyuranger! It’s Monday – that means another Official Power Morphicon guest update! Joining the list of over 90 special guests is the beautiful, one and only Melody Perkins! She played the very iconic role of Astromena in Power Rangers In Space, the Princess of Evil who had a secret past with Andros the In Space Red Ranger. She would return in Power Rangers Lost Galaxy and become the Pink Ranger, making her the first and only series main villain to return and become a Power Ranger in another series (Rick Medina would do the opposite, going from Power Ranger to a main villain in Power Rangers Wild Force to Power Rangers Samurai). But she wasn’t the only guest to attend – check out the list of added guests below! If you haven’t registered for Power Morphicon then we have some bad news – time is running out! Registration is rumored to close in the next few weeks! Don’t waste any more time – click here to begin your registration process! TokuNation.com as well as the Talkin Toku Podcast will be in attendance at this year’s show as platinum members, giving us front row seats to all panels, events, and early access to the show room! We will bring you on-the-spot coverage with news, pictures, interviews, and more! We’re also attending the show with our good friends from the Ranger Command Power Hour Podcast, and we have some very fun events planned with them during the course of the show, of which we will be sure to update you on! See you at the show! 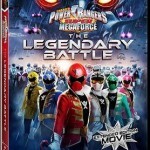 Super Megaforce Marketing Teaser, Legendary War Footage! Not to be outdone by the official reveal of the Super Megaforce Silver Ranger yesterday, Saban Brands has officially released it’s marketing teaser for the Power Rangers Super Megaforce Fall 2014 lineup. Much of this video showcases Saban Brands worldwide extent in toys & licensing, and focuses on Megaforce & Super Megaforce up to where we are now. But the tail end of this video features the first released footage of the Legendary War from the Super Megaforce finale later this year! As always these awesome ranger related images & info come from Fury Diamond and the Rangercrew Blog, as well as Silurian Ranger! Get ready to Go Go Megaforce with the most powerful Ranges in history this fall on Nickelodeon!